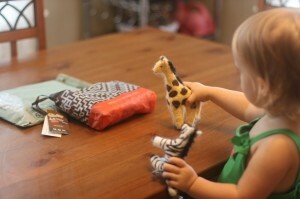 This is a joint giveaway with Natural Parents Network and Hobo Mama Reviews. You may enter at only one site. Please find the section marked Win It! for the mandatory main entry and optional bonus entries. 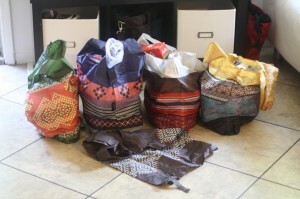 Guest review by Lauren B.
I've had my own cloth grocery bags for a few years now. I made them myself when I was first learning to sew, and to be perfectly honest, never really liked them. They were a thin, woven canvas-like material, the proportions were all wrong, and they were always messy in the trunk of my car. Eventually I quit using them, and while I felt guilty about getting plastic, it wasn't enough for me to bring in my own cruddy old bags. Thus, I was delighted to have the opportunity to review the Envirosax 5-in-1 Pouch, offered by ConservingNow. I headed over to their site to choose a pattern. There are (at current count) 18 sets to choose from, and I must've spent a good 45 minutes perusing them before settling on Nomad. The bags arrived via USPS in a recycled paper sleeve. The first thing I did was unsnap and open up each of the bags to see the designs. I'm not going to include a picture of my homemade cloth bags, because the Envirosax put them to shame. My first impression was that they were light and strong, and seemed to be just the right size. I was a little worried about getting them rolled back up and snapped, but by the time I got to the fifth bag, I'd gotten the hang of it. An instructional video is included here, but I didn't need it. I always do self-checkout at the grocery store because I prefer to organize and pack my own bags. I unsnapped the bags and packed them one at a time, starting with the milk. The bags are advertised as being tested to hold 44 pounds, so I loaded one of them up with a gallon of milk, two containers of juice, and a quart of cream. There was room on top, but I did want to get to the other bags. For $110 worth of groceries, I only ended up using four of the five bags, and I could easily have fit more things into those four if I'd needed to. All my groceries and one bag still left over! One of my favorite things about these bags is that the handles are long enough that I could put them over my shoulders. It was slow-going, but I ended up carrying all four bags into the house in one trip. 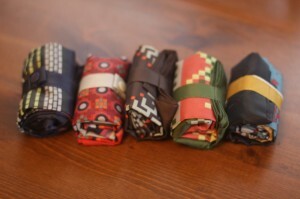 Overall, the Envirosax bags are everything my homemade cloth bags were not. They're beautiful, strong, and perfectly-sized. I'll be using them for a lot more than grocery shopping, and at least three people on my holiday shopping list will be receiving them as gifts. I might even buy myself another set, just for the pretty. Now I'll just have to take the time to figure out what patterns to get. You can purchase your own reusable bags or totes at ConservingNow. Bags range in price from singles Envirosax bags at $7.99 to Envirosax 5-in-1 pouches at $34.99. They also carry a line of reusable cotton totes and Market Bag sets. For your chance to win your very own Envirosax 5-in-1 Pouch in your choice of pattern, enter here. Contest is open to US and Canadian residents. All entries will be recorded using Rafflecopter and a winner will be chosen at random. Contest is open from August 13, 2011 12:01 am EST until September 13, 2011 11:59 pm EST. We will pick the winner using Rafflecopter to run the giveaway and send an email notification. Leave a valid email address as part of your mandatory entry comment so we can contact you if you win. If we can't reach a winner or don't hear back within a couple days, we'll draw a new name. For actions like following and subscribing, if you already follow or subscribe, just let us know in the Rafflecopter form. Contest closes September 13 at 11:59 p.m. PST. Disclosure: Our reviewer received a free product for purposes of the review. 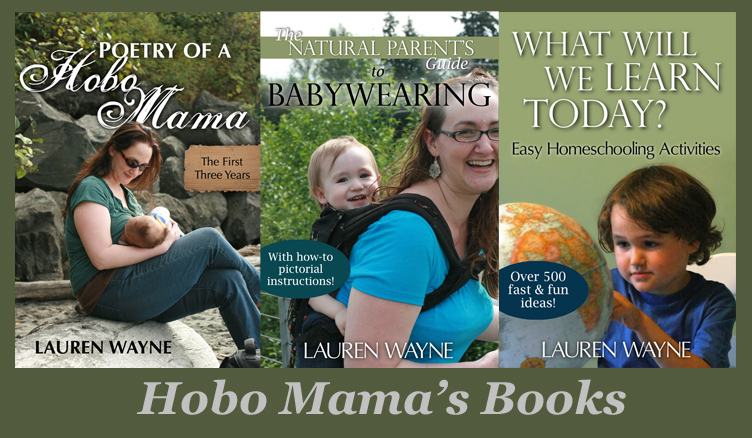 Lauren B. is a SAHM to her toddler daughter, Rowan, and is firmly committed to the principles of natural parenting. She's proud to be a part of this growing community. A very important thing that ConservingNow does on their website is provide information on teaching children how to be environmentally conscious and gives practical ways children can be involved. All the EnviroSax designs are pretty cool, but I really like the Bloom series. My whole family will enjoy the bags, but we always forget to bring bags to the grocery! Looking forward to having these handy so we will (hopefully!) forget less! Educating kids about conservation is a very important step in changing our world. I love that Conserving Now is focusing their main effort on that. I also like that they are partnering with other groups to help spread the word. I love the Envirosax - Bloom 5-in-1 Pouch. When I was in China, we have to pay for plastic bags, and soon I learned that to recycle even plastic bags took a long while! Everyone over there saved a lot of money by bringing their own bag. I will really enjoy this bag for grocery/traveling purposes. my kids will like them. I took them shopping with their money the other day and they liked each carying their own reusable bag and they liked they got .05 off at target for it. I like that they put effort into education on being "green" for kids. I like the After Dark set. I'm impressed... They have a Classroom Kit to help teach children in school about being green! I'd love to win the Sesame Street Series! We'd keep it for our family and use them for everything from grocery shopping, farmer's market trips, and library days. love the bloom series, and how compact they roll up! I like it that they have a simple pledge on their website that everyone can pledge to reduce their use of plastic bags! I really like the optimistic set! The Household Survey is a great way to wake folks up and show them just how much they are wasting!! I love the Bloom series! I could always use more Envirosax, but I think I would give these to my Mother-in-law who still uses *gasp* plastic bags!! I love that they have classroom education kits! I like the Planet Green! I would keep these for me! I would love to have the Animal Planet Series! They have tips on reducing plastic bags, like bringing them to the dog park, and they have a teacher kit (it would be great if my kid's teachers used it!). I would keep some and share some bags! Those classroom education kits are such a great idea! I think it is neat they give away free window clings.